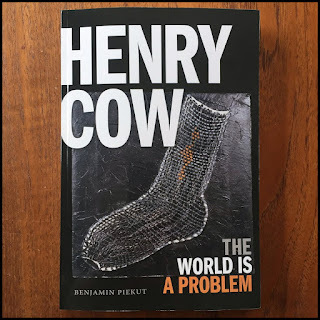 La data di pubblicazione del libro di Benjamin Piekut Henry Cow-The World is a Problem è ormai vicina, a settembre secondo la Duke University Press. Per ora ne hanno copia provvisoria correttori di bozze e lettori di fiducia. In September 2019, Duke University Press will be publishing a new book on the experimental band Henry Cow, Henry Cow: The World is a Problem. The avant-rock/jazz band featured a rotating cast of members and continuously challenged genre and other conventions. Active in the UK and Europe, but never quite popular due to their uncomprising committment to experimentation and their radical politics, Henry Cow performed and recorded from 1968 until 1978. Drawing on ninety interviews with Henry Cow musicians and crew, letters, notebooks, scores, journals, and meeting notes, music scholar Benjamin Piekut offers the definitive history of the band. He traces the group's pursuit of a political and musical collectivism, offering up their history as but one example of the vernacular avant-garde that emerged in the decades after World War II. Benjamin Piekut is a historian of experimental music, jazz, and rock after 1960. His first monograph, Experimentalism Otherwise: The New York Avant-Garde and its Limits, was published in 2011 by the University of California Press. He is also the editor of Tomorrow Is the Question: New Directions in Experimental Music Studies (Michigan, 2014) and co-editor (with George E. Lewis) of the Oxford Handbook of Critical Improvisation Studies (2 volumes, 2016). His second monograph, The World Is a Problem: Henry Cow and the Vernacular Avantgarde, is under contract with Duke University Press. His essay in The Drama Review, “Deadness,” co-authored with Jason Stanyek, received the “Outstanding Article Award” in 2011 from the Association for Theatre in Higher Education. Previously a lecturer at the University of Southampton.